How many ways can you make a cube out of 7 dissimilar pieces? This and other giant, life size puzzles await you in the puzzle room. Manoeuver the large pieces around the floor, complete the puzzles on the walls, ask for assistance or persevere on your own. This area contains a variety of large and small puzzles as well as foam and timber building blocks. We have magnetic Tangrams and a giant world map with magnetic flags located on the various walls. Children move the pieces around the walls solving the puzzles and learning some geography whilst having fun. 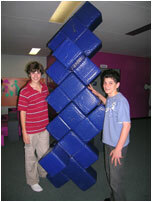 We have large and small floor puzzles the largest being 1.6m long X 1.0m wide . Children and adults are required to lift and manoeuver the individual pieces around in an attempt to put the puzzles together on the floor. Pieces are lightweight (made from polyurethane or timber) and contain no hard or sharp edges. Children are not required to stand on any apparatus to put the puzzles together, minimizing the risk of falling. Our building blocks are very popular and are used to construct forts, bridges, giant cubby houses, tunnels or whatever you desire. Use your imagination and like everywhere else in Taskworks ask a friend or our staff to help.